When addressing drug security, a discrepancy is any situation in which the quantity of drug present in a particular location is not the quantity expected. Before the widespread use of automated dispensing cabinets (ADCs), the discovery of discrepancies was often the primary means by which diversion could be identified, and diverters were emboldened by the fact that a discrepancy could be attributed to anyone who had access to the medication between the last inventory and the time of discovery. Now that ADCs are widely used in the vast majority of health care facilities, blind counts are typically required each time a controlled substance bin is accessed. As such, the moment a discrepancy appears can be determined with pinpoint accuracy, and the list of people who might be responsible can often be narrowed to two. The sophistication of the ADCs in identifying the responsible party has led to a corresponding increase in diverters’ sophistication at circumventing the ADCs’ tracking of controlled substances. For many facilities, discrepancies in the controlled substance count are deemed an ongoing annoyance, but one that should be dealt with as quickly and directly as possible. Creating a discrepancy and leaving it to be found is no longer a popular method of diversion because it is too easily discovered. If a staff member were to help himself to five extra oxycodone tablets at the cabinet when withdrawing a two-tablet dose for a patient, the next staff member accessing the oxycodone would discover the shortage, and attention would be drawn to the theft. If the facility requires staff to be attentive to discrepancies, the diverter would be discovered quickly, and the diversion stopped. Conversely, when discrepancies are not a priority, staff intent on stealing controlled substances will quickly recognize this and take advantage of the lack of attention. It is not uncommon for a staff member to test the system with small discrepancies both on the units and in the pharmacy, and when there are no repercussions, to then remove extra controlled medications regularly, confident that no one is watching. All facilities are expected to maintain accurate records of their controlled substances.1 Even a surplus in medication, a discrepancy in which more drug is present that expected, should be cause for concern. At the very least, an overcount indicates a failure of accounting and may be a marker for sloppy practice. Typically, institutions require resolution of discrepancies to occur within the time frame established in the controlled substance policy and procedure (P&P). However, the quality and usefulness of the resolutions can vary greatly from institution to institution, and even from unit to unit within the same institution. To log a discrepancy as resolved in an ADC, a reason is required. Too often, an unhelpful reason is recorded, such as, “under investigation,” “miscount,” or “pharmacy error,” with no effort made to establish what actually happened to the missing drug. Every discrepancy should be recorded and then appropriately and thoroughly resolved. Furthermore, any patterns should be monitored. Even when the final counts are correct, repeated discrepancies may be indicative of diversion. There have been multiple case examples of a staff member repeatedly creating and resolving discrepancies for a specific medication, usually within the same shift, in order to cover up a tampering scheme. In one case, the staff member created a discrepancy by removing a vial, using a small needle to siphon the medication through the plastic cap, self-injecting in the bathroom, refilling the vial, and then slipping it back into the ADC at the time of discrepancy resolution. Another case involved a staff member pulling packaged opioid pills from the ADC, making small punctures in the packaging to remove the opioid, replacing the tablets with a look-alike medication, resealing the packets with clear tape, and then returning them to the ADC during discrepancy resolution. In both cases, the ongoing inventory in the ADC always reflected the actual number count in the bin. Because these transient discrepancies were not tracked or investigated, the schemes continued for a considerable time. There is significant risk that clinical staff will become desensitized and come to regard discrepancies as benign events, which are best deferred to pharmacy for handling. Likewise, staff may become discouraged and regard a given discrepancy as a mysterious event, one that is difficult, if not impossible, to resolve accurately. When a disconnect exists between clinical staff and pharmacy regarding who is responsible for finalizing resolutions, discrepancies may linger and grow. I have visited institutions wherein hundreds of discrepancies dating back several years remained open in various locations, including the ADCs and the automated vault. In such instances, it is important to reject the inclination to simply clear the discrepancies and start over; each discrepancy requires investigation and resolution, a task that can consume a great deal of staff time. It is critical that the accuracy of the resolution be given priority over speed. Some facilities, in the zeal of their newfound attention to drug security, create policies that require staff to resolve all discrepancies quickly, often by the end of each shift. While this is appropriate, it should be understood that some discrepancies may not be resolvable within this time frame. If the policy dictates that staff members who fail to resolve discrepancies by the end of the shift will be penalized, staff will often take perfunctory steps to achieve resolution in order to meet the deadline and remain in compliance. The unfortunate result of this approach is that true patterns are not discovered or tracked. When there is an increased focus on discrepancy resolution, training must be provided to ensure staff understands how to appropriately resolve a discrepancy, and the policy should outline steps to take when that is not possible. Policies should always be constructed in a way that serves the main purpose of resolving discrepancies: to detect and prevent diversion. The longer a discrepancy goes undetected, the more difficult it is to resolve. Facilities should keep this in mind when establishing a policy for controlled substance inventories (see TABLE). Among institutions that mandate regular inventories be conducted on clinical units, the required frequency varies from as often as every shift to as infrequently as every week or longer. Some facilities require clinical staff to count accessed controlled medications during inventories, some choose to focus only on CIIs, while others require regular inventories of all controlled medications (ie, CII-V). The most common approach is to require a weekly inventory of all controlled substances. Weekly inventories are usually sufficient for maintaining an accurate account of controlled substances; however, for a facility with pervasive discrepancy issues or a particular clinical unit that struggles with discrepancies, it is strongly recommended that inventories be conducted on each shift, at least temporarily. Discrepancies in the hospital pharmacy often are not assigned the same priority as discrepancies on clinical units. At the very least, the same level of vigilance is needed for inventory accountability in the pharmacy. Some of the most expansive diversion schemes I have encountered could have been substantially limited had regular inventories been required in the pharmacy. 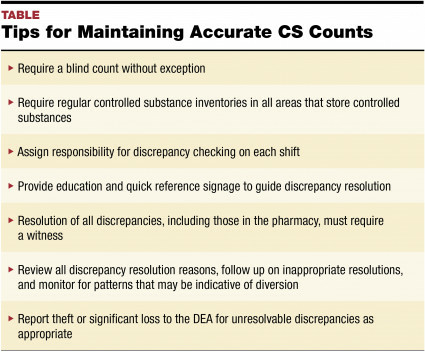 Discrepancy resolution in the pharmacy requires accurate records of drug procurement, distribution, and disposal, and accurate resolution is just as critical in pharmacy as it is in clinical areas. Any discrepancies that occur must be fully investigated, and resolution must require a witness in all cases. Just as in clinical settings, inventories should be conducted regularly in the pharmacy. Owing to the sheer volume of controlled medications, it may make sense to stagger inventories over a period of time, with the goal of completing a full controlled substance inventory at least monthly. Care should be taken to ensure that inventories include overstock items, items not in automated storage, and expired controlled medications awaiting destruction. Facilities should ensure the inventory process is accurate and thorough; this means avoiding shortcuts. In one pharmacy, staff placed sticky notes with tallies of the contents on previously open boxes to avoid having to count the product. After relying on these paper tallies for some time, staff ultimately discovered that several boxes contained approximately one-third of what the medication tally sheet indicated. Discrepancies in the retail or outpatient environment involve a somewhat different set of problems from those in clinical units or hospital pharmacies. In the retail environment, only pharmacy staff or an intruder could be responsible for theft of a drug, so there is a strong motivation for staff to explain discrepancies as resulting from an accident or mistake. It is not uncommon for discrepancies in a retail pharmacy to be explained away as the result of accidental disposal, without any investigation being done. For that reason, it is especially important that cameras cover all areas of a retail pharmacy where controlled substances are handled, and the footage should be maintained for at least 30 days before being overwritten. Furthermore, ongoing counts or inventories are a key component of discrepancy identification in this environment, and inventories should be conducted at least monthly. Pharmacy leadership should keep in mind that when logical denominations are missing, it should not automatically be assumed that someone accidentally threw away a bottle or a package. In more than one case, a savvy staff member diverted medication in quantities that would be assumed to be a missing container. When creating P&Ps for discrepancy management, it is important to review discrepancy identification and resolution in non-automated settings as well. Best practice in these settings is to either conduct a per-shift inventory or an opening and closing inventory; this inventory must be documented and witnessed. Facilities should ensure these inventories are both ongoing and meaningful by regularly auditing the records. Discrepancies will occur everywhere controlled substances are used; this underscores the importance of providing widespread education to ensure that staff is capable of appropriately addressing discrepancies. If there is a pervasive issue with inappropriate discrepancy resolution, this may be indicative of the need for re-education on how to resolve discrepancies properly. To support staff efforts in discrepancy resolution, consider providing a quick reference guide at each ADC. To reinforce your institution’s ongoing commitment to diversion management, be sure to incorporate discrepancy resolution duties into your regular staff education. US Department of Justice/Drug Enforcement Administration: Diversion Control Division. Title 21, Code of Federal Regulations, Part 1304 – Records and Reports of Registrants. www.deadiversion.usdoj.gov/21cfr/cfr/1304/1304_22.htm. Accessed August 23, 2018. Cornell Law School: Legal Information Institute. 21 US Code § 842 – Prohibited Acts B. www.law.cornell.edu/uscode/text/21/842. Accessed August 23, 2018. United States Department of Justice. Southern District Of Georgia Announces Largest Hospital Drug Diversion Civil Penalty Settlement in U.S. History. www.justice.gov/usao-sdga/pr/southern-district-georgia-announces-largest-hospital-drug-diversion-civil-penalty. Accessed August 23, 2018. Kimberly New, JD, BSN, RN, is the founder of Diversion Specialists, LLC, a consulting service providing solutions for all aspects of institutional drug diversion. She is a specialist in controlled substance security and DEA regulatory compliance, working with health systems across the country to establish and expand drug diversion programs, with the overriding goal of improving patient and staff safety. Kim is also the co-founder and executive director of the International Health Facility Diversion Association.